The coming weeks are a particularly difficult time for drivers, with many folks out on the road and away from their families during Thanksgiving and Christmas. As we’ve all become accustomed to knowing, the world of freight never stops for those with trucking jobs, especially in the throes of holiday season. An estimated $830 million was spent by Americans during the Holiday season last year, which in turn translates to a great deal of truckers working endlessly to fulfill holiday shopping needs. For the drivers that do have the opportunity to spend some quality family time with loved ones, it’s hard to do much shopping while on the road, much less get into the Holiday spirit altogether. With that in mind, there are some guidelines for drivers – and their loved ones – to think about as we head into the end of the year. Many drivers will feel pressure to take on an extra run in order to pad their pocketbooks for the holiday season. 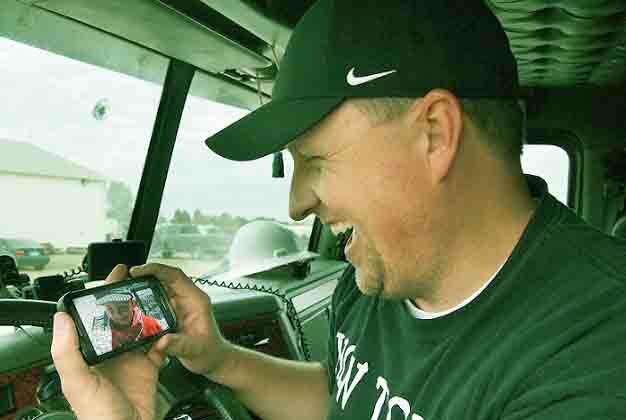 There is often external pressure on drivers to take on extra runs in order to ease the job of the entire fleet, with an incentive to be a team player and to help your fellow trucker out. This becomes a slippery slope, however, when picking up some slack soon becomes an indication of a “workaholic.” Too much work can easily lead to exhaustion, and with exhaustion comes the uninvited opportunity of fatigue on the road. Keep in mind that no family or friend wants to think of their loved one on the road as somebody at risk. Take on the extra work as needed, but do in so in moderation and with health and safety in mind. For drivers who have adopted mobile devices, your phone, tablet or laptop can be an excellent way to stay connected during the holidays as well as a way to stay on top of one’s Christmas shopping. When working OTR during the holidays, truckers are hard-pressed to find much time at all to complete Christmas shopping – using one’s phone to peruse sites such as Amazon and Target are a great way to stay on top of gift-giving. There’s not much need for in-store shopping in this day and age, and it eliminates the possibility of forgetting one’s Christmas list. Mobile devices and apps such as FaceTime and Skype are an excellent way to keep in touch with loved ones and to send them Holiday greetings if you cannot be there in person to wish them well. It’s easier than ever to stay connected when on the go. Communication with others is key for a healthy work-life balance and a good state of mental health for drivers. As we become more casual with our holiday celebrations, there is less pressure for families to create the so-called perfect Christmas. When you do get the opportunity to celebrate the upcoming holidays (whenever that may be) remember that your overall presence is more important to the holiday than anything else. It’s about spending time together rather than planning something elaborate, and getting to have a nice meal paired with quality time is what your loved ones will recall down the line. It’s certainly not easy to hold a truck driving job and provide your family with the “dream Thanksgiving and Christmas” but rest assured, a perfectly nice holiday celebration can be achieved.